On March 6, 1987, the ferry Herald of Free Enterprise, leaving Zeebrugge port in Belgium, overturned, killing nearly 200 people. Among the passengers were many British people, using a special offer in tabloid newspaper The Sun, allowing them to make the crossing for just one UK pound. The closing choruses of the song feature an ensemble choir featuring many of the above performers as well other recording artists. The back-up chorus consisted of: The Alarm, John Altman, Debee Ashby, Al Ashton, Rick Astley, Bananarama, Simon Bates, Alison Bettles, Jenny Blythe, Errol Brown, Miquel Brown, Bucks Fizz, Jay Carly, The Christians, Nick Conway, Linda Davidson, Hazell Dean, Anne Diamond, Difford and Tilbrook, Doctor and the Medics, The Drifters, Drum Theatre, Frankie Goes to Hollywood, Roy Gayle, Go West, Carol Hitchcock, Felix Howard, Gloria Hunniford, Imagination, Jenny Jay, Ellie Laine, Annabel Lamb, Stephanie Lawrence, Loose Ends, Linda Lusardi, Ruth Madoc, Bobby McVey, Suzanne Mizzi, The New Seekers, Sadie Nine, The Nolans, Hazel O'Connor, Mike Osman, Su Pollard, Tim Polley, Pamela Power, Maxi Priest, Princess, Jimmy Pursey, Suzi Quatro, Mike Read, Sally Sagoe, Nejdet Salih, Ray Shell, Mandy Smith, Neville Stapleton, Alvin Stardust, Steve Strange, Sylvia Tella, Terraplane, Bonnie Tyler, Maria Whittaker and Working Week. The recordings took place on March 14, 15 and 16, 1987. 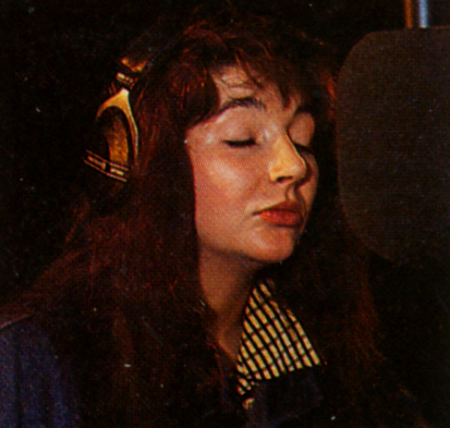 Kate Bush appeared on March 16, 1987 to sing her part. There had been some confusion about whether she would be there for the recording or not. When she finally appeared on the Monday, she explained that she had been ill over the weekend. She was the first artist to have the studio cleared, and also the first to refuse all interview requests, saying "It's for the cause - It's not what I've got to say." Ferry Aid. Wikipedia, retrieved 10 November 2014. 'Ferry Aid'. Smash Hits (UK), March 1987.